Iconic cross on Carrauntoohil cut down. 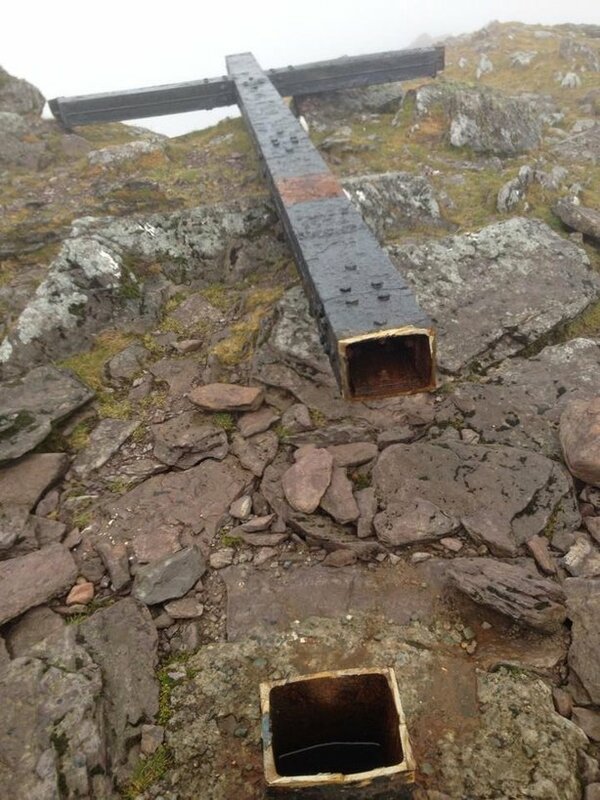 An iconic five metre steel cross at the top of Ireland’s highest mountain, Carrauntoohil has been cut down. The cross has been at the summit of the mountain for almost 40 years. No motive is known for the attack. The discovery was made this afternoon by a group of climbers as they reached the summit. It is understood an angle grinder was used to cut down the cross, approximately a foot from its base. The cross has been pushed westwards. It took around 100 people to erect the steel cross at the top of Carrauntoohil in 1976. The cross was brought to the summit in several pieces before being welded together and erected. The event was covered on television by RTÉ news at the time. Since then the cross has become an iconic attraction where people who climb Carrauntoohil take pictures to mark the occasion. The cross is believed to have been cut down in the past number of days, possibly as recently as the last 24 hours.